If a true baguette is a French nobleman, tall and lean, a crusader for tradition and preservation, then butter is the stout and shy wife, staying home and cooking while her husband goes out and gets all the attention. 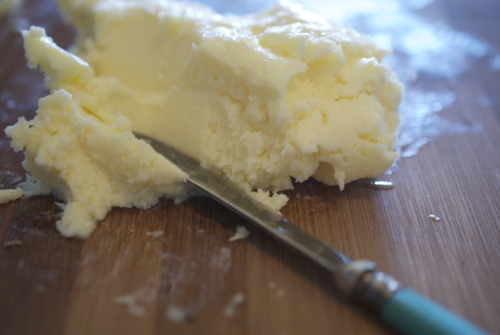 But, if I’m going to keep these metaphor going, she is an unsung hero, because good proper French butter, cultured and flecked with sea salt is beautiful and delicate, and tastes better the next morning that her stale mate. 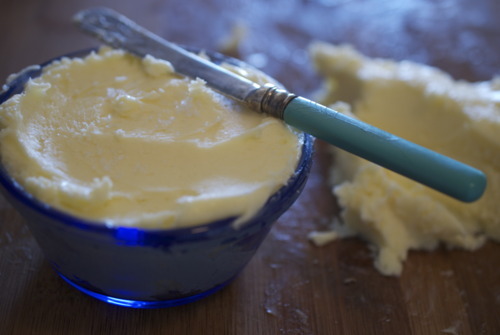 My love for butter is long stated and probably can be traced back to one of my favourite childrens book to a poem where the King is so distraught that he can’t get butter with his bread that he goes back to bed saying “No one could call me a fussy man, BUT, I do like a little bit of butter for my bread”. A trip to France a couple years ago cemented it for me, butter is a beautiful beautiful thing. Normandy is famous for it’s butter, and rightly so, but Normandy is a long way away from my Vancouver apartment. So I’ve been looking up ways of making butter recently. 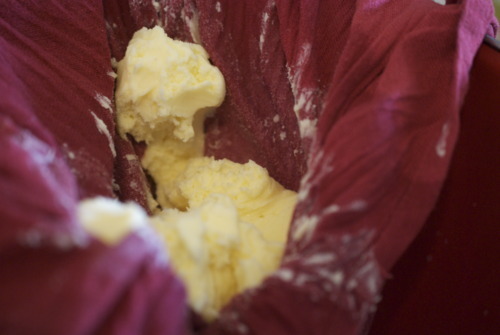 I remember doing it as a kid, taking a jar and shaking it until the fat split from the liquid, and I’ve done it in restaurants when there is cream about to go off, but it always makes simple plain butter. The butter I’ve been dreaming about since Paris has a much greater flavour to it. So when I saw this recipe on Food52 I new it was fate. Friends, this is damn good butter, as best as I have tried on this continent. The trick is to be patient, to use the absolute best cream you can find and to have some really good bread to spread it on when it’s done. In a large bowl mix together the cream and the yoghurt. Let it sit, covered, at room temperature for at least 2 hours or longer if you wish. Check it periodically by dipping a clean finger (or spoon!) into it and tasting it. 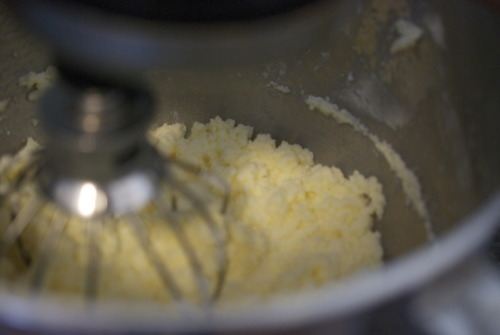 Once it gets a nice slightly cultured, sour taste to it you can start whipping it. 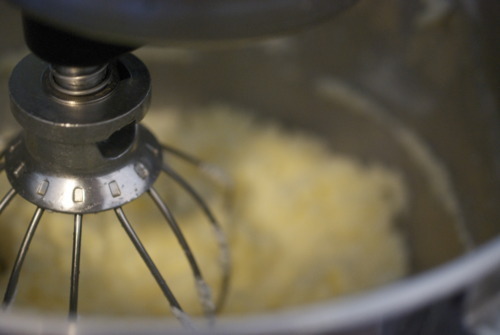 You can do this with a standing mixer, a handheld mixer or you can put it in a well sealed jar and shake it. In my standing mixer this stage took about 15 minutes, but the cream with thicken and then start to seperate, the fats splitting from the liquid. While this is happening put a colander inside a bowl, and line the colander with cheese clothe or a thin tea towel. Let it strain for half and hour or so, you can give it a squeeze periodically to help it a long. Once nearly all of the moisture is gone and if you pinch it between your fingers it doesn’t bead out bits of water your ready to go. On a clean counter top press it down into a small square. Sprinkle the salt on top and then fold it in half, then again then again and again. 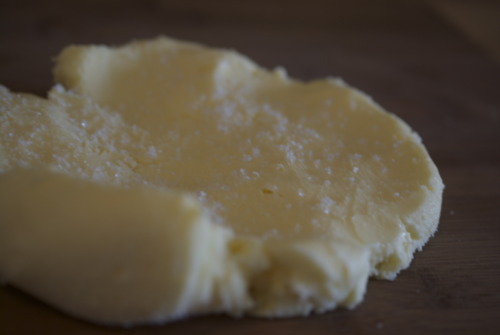 Then you can press it into a mold, or just put it in a bowl like I did, with a little more salt sprinkled on top!